Long before Darwin’s Origin was published in 1859 there was in Victorian society a strong popular interest in natural history. Not only did the microscope reveal previously hidden wonders, exposing for the first time the sexual life of plants, but advances in printing technology made it possible to reproduce and disseminate such images – in color – among the new and rapidly growing middle and working class populations. An excellent example of this historically unique intersection between science, technology and religion just appeared on my desk: the 1855 edition of Rev. Charles Kingsley’s Glaucus, or the Wonders of the Shore. Kingsley, an impulsive country parson and Christian socialist, author of Westward Ho! and The Water-Babies, is best known for calling John Henry Newman a liar and a knave “to his face.” As I have always been grateful to Kingsley for provoking Newman to write his great autobiographical defense of Catholicism, I decided to take a closer look at this book. 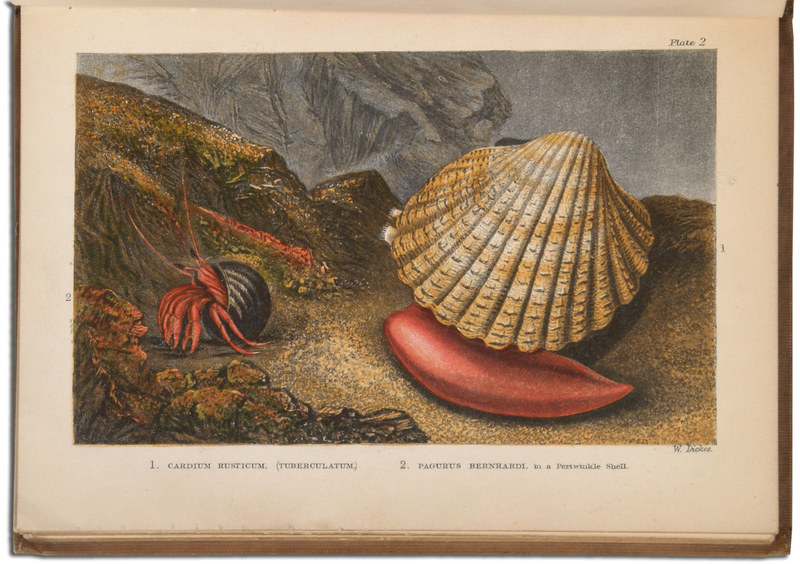 These color plates are typically misidentified as hand-colored lithographs or chromolithographs. By the 1850s lithography was the cheapest and fastest way to achieve commercially viable color prints, but a close inspection of the plates in Glaucus reveals etching, aquatint engraving, and wood engraving, i.e., a combination of intaglio and relief printing. The best color prints were achieved by printing from multiple wood blocks engraved on the end grain of a hard wood like box. As this was a labor intensive process and a less versatile medium, George Baxter developed his more commercially viable method of combining intaglio and relief processes – and sometimes lithography (a planographic process) – which allowed for the artistic effects and versatility of finely inked lines and etched tones in metal to be had in combination with colors printed from wood. Baxter described his process as “printed in oil colours,” and a few modern museum curators have indeed mistaken a Baxter print for an oil painting! The process involved the successive printing, one color at a time, upon an initial impression taken from a key block of the design. The key block was typically a steel plate, and the successive impressions of colors were taken from up to twenty blocks of wood. It was this overlaying or building up of color upon an etched and engraved design in black that gives the overall impression of an oil painting. Of crucial importance in obtaining this effect was the skill of the printer in creating the color inks used and in maintaining an exact registration on the sheet during the printing of each impression. Baxter devised a special arrangement of registration points on the tympan of the platen press, and he patented the process from 1835 to 1854. William Dickes was one of only five English engravers and printers granted a license to utilize the Baxter process. Pictured above are two common wonders from Glaucus: on the left a Common Hermit Crab (“Pagurus Bernhardi in a Periwinkle Shell”), and on the right a Red-Nosed Cockle (“Cardium Rusticum”). As this print is principally tonal, the key-design in black is mostly aquatinted, with etched lines used to outline the crab and the patterning on the cockle shell. The background aquatint grain is lightly etched and printed in black and blue, giving the illusion of three-dimensional depth in contrast to the deeply etched foreground aquatint grain giving the sea floor and rock built up in combinations of black, blue, brown, green and vermillion, with the dramatic three-dimensionality of the crab and cockle’s long foot and shell achieved almost entirely from wood engraved blocks giving a combination of the densest patches of the brightest colors ranging from brilliant crimson red to pale vermillion and creamy off-white. This is fine craftsmanship by W. Dickes and Company. Dickes continued to make Baxter process prints after his license expired on through to the 1870s, when photographic processes began to displace the older mechanical processes. The older processes relied on an artist to draw and color the original design, a craftsman who engraved and made the original printing surfaces, and the printer who mixed the color inks and made the complex series of multiple impressions. A genius like William Blake did this all himself. We know that Dickes was a skilled wood engraver and printer, but such complex work requiring long press runs required many skilled hands. Prints made by Baxter himself are today highly sought after by enthusiasts. Although they can be easily identified by his phrase, “Printed in Oil colours by G. Baxter, Patentee,” it is typically no longer present on the surviving prints. Among the licensee’s who made Baxtertype prints, the best are those by J. M. Kronheim, Le Blond & Co. and W. Dickes & Co.
Or you can just buy the original from BTC.